I’ve said it before and I’ll say it again…learning to live well with another human being can be challenging! Disagreements are going to happen and, if both people are being real enough, sometimes you may even fight. Hey, it happens. What’s more, sometimes it is even healthy. I am going to write a bit about fighting and what precedes it and keeps it going: anger. Angry emotions make people uncomfortable. Angry emotions are also highly contagious. Many people will go to great lengths to avoid feeling angry and to even greater lengths to avoid others from feeling angry at them…and yet some people have trouble with feeling angry nearly all of the time. We all know someone who is set off easily, or is known for being angry all the time. If you are in a relationship with this person (or you are this person), this is a hard place to be. Before we give anger the ultimate bad rap, let’s look at it for what it is. It may surprise you, but not all types of anger are equal. When we look at what is behind anger, there are at least 10 different types of anger! (By the way, if you are struggling with anger issues, please, seek help with a therapist, or at least research this yourself with self-help books – but do SOMETHING to help yourself manage your anger for the sake of your own happiness and the health of your relationships too). This type of anger can be seen. It is action oriented and is aggressive towards someone or something that triggered it. This can be someone who often acts out and becomes aggressive easily. Sometimes the outcome is physical abuse or actual physical attacks against others (road rage, bar fights, etc). This can be seen, but is not as easy to see as Action Based anger. It is often expressed through sarcasm or making mean fun of others as a way to mask their own anger. People using hidden anger tend to avoid confrontations and may appear passive, when in fact, they are actively angry on the inside. Not all anger is easy to see! Vocal anger is expressed not as much physically, but through words instead. Verbal abuse is used to criticize and insult people (put them down) and complain. Self-harming anger is anger that is rediirected to one’s own body. People who use this type of anger believe they are punishing themselves for something they have done wrong. Some examples include starvation, cutting, and overeating. 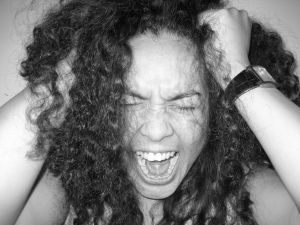 This form of anger occurs in varying degrees and can come and go unexpectedly. It can just appear out of nowhere, or build into something bigger. It can either explode or go unnoticed. It could even be expressed verbally or physically. Habitual anger is anger that seems ever present. Do you know someone who seems to be angry all the time for no reason? More than likely, they have a habit of being angry and have brought that into their story of who they are. People with habitual anger are just mad in general. Habits can be broken! Putting other people down and making them feel bad about themselves, or abilities, is a form of judgmental anger. This person expresses their feelings by making those around them feel worthless. This person relieves stress by shouting, and flying off the handle, when they can’t take situations and things that are happening around them, anymore. When things are just too overwhelming… which is why it’s called ‘overwhelmed anger’. This is probably one of the most common, of the bunch. Retaliatory anger usually occurs as a direct response to someone else lashing out at you. Remember how I said anger can be contagious? Using anger to gain power over a situation or person. A person expressing this form of anger may not start out angry, but will get angry when something does not turn out the way they wanted. Or, someone doesn’t see eye to eye with something they planned. Okay, so there you have it, 10 types of anger. But wait, there’s more! There is a type of anger that is not actually destructive! This type of anger is a key factor in driving people to want to join movements and groups. It’s the feeling of being fed up with how things are going, and the need to make a positive change. This, within reason, is a healthy channel of anger and has historically created many positive changes in the world. One more point about anger. Every human being feels anger. Anger itself is not the problem; it is what you do with it that counts. Feeling angry is not bad, it is just a feeling that is a reaction to something happening and the thoughts and beliefs you have about it. Anger does not need to be put in control. If your anger is getting the best of you, it is time to get some help. If you or your partner struggles with the healthy expression of anger in your relationship, please, seek help and support. Unhealthy anger habits and behaviors are extremely damaging.